Arriving at Halifax in the car, one foggy day in September, we were faced with an imposing set of Victorian built Mills, set cheek by jowl beside a spaghetti junction of 60s roadways and flyovers and the ancient Yorkshire countryside – a fascinating and beautiful picture of what was once the industrial north. The Mills were in fact our destination – Dean Clough, a converted wool Mill in the centre of Halifax, where we would be staying for the night before our show at the Square Chapel Arts Centre. Now entirely re-developed, the site houses a complex of shops, restaurants, art galleries, our Travelodge for the night, and a cookery school; whilst still managing to maintain the grandeur of the original buildings. Obsessed with composition and intent on entering the burgeoning scene of street photography I have recently bought a new camera. Street photography attempts to capture those fleeting, illuminating flashes of interaction between people that happen all around us, all the time, in the blink of an eye. I would argue that the right snap at the right moment could tell as much story, as much biography as any painstaking recreation. With some time to spare as we pulled up and always in pursuit of another elusive vignette, I asked Matt (Llewellyn-Smith – stage manager extraordinaire) to help distract a group of men whilst I took their picture. On the journey from Grantham that morning we had heard a radio programme about a woman with one prosthetic arm, which she had managed to keep hidden from almost everyone she met for many years. On one occasion, it wasn’t until the run of a show she was dancing in had ended that her fellow chorus members discovered that she only had one arm. We decided to adopt some of her distraction techniques. Matt and I chatted as we drew level with the group, paused in the correct place and both pointed rather awkwardly at something off in the distance as I surreptitiously snapped. Matt led the conversation as I took a few more shots from waist height. As it turned out, my three middle-aged subjects were jovial and welcoming and the five of us quickly fell into conversation. We spoke about the Mill itself, about what we were up to and about how they decided who got to sit on the only deck chair they had between them. We mentioned that we had played Stamford the night before when one of the crew disappeared, momentarily returning with a dusty copy of ‘Villages of Rutland’. “It’s the smallest county in Britain for half the year – except when the tide is in on the Isle of Wight” they laughed. I asked them for a photo, and to my surprise, they agreed. The group directed us in the opposite direction, towards ‘E’ Mill (the different Mills are distinguished by a different letter), the main building off to the left of us, where David Hockney had once painted a wall and sold it for £25,000. But despite the Hockneys and the original blueprints and photographs of this incredible building, the work we were told specifically to look out for was one made of Lego. 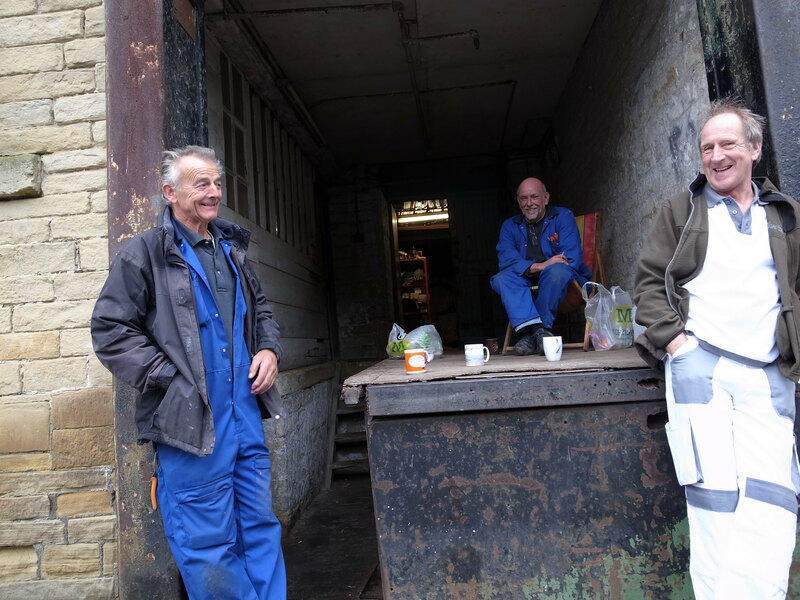 Matt and I left the workers to their tea, paid the parking and laughed as we pored over my photographs. In my opinion the best shots are definitely those taken covertly. Unposed photographs capture the live energy of intention and action, by comparison those that are posed look rigid and staid and surely serve only posterity. An hour or so later I was working my way around the photography gallery inside ‘E’ Mill when two of the three workmen from earlier appeared from an internal staircase, hulking a step ladder. “Have you seen it?” they asked. But I didn’t know what I was looking for, I wasn’t even sure that they weren’t having us on earlier. But sure enough, around the corner, standing at least a metre and a half in height and around five in depth stood a massive Lego reconstruction of the entire Mill. Jeff proceeded to walk me round the Lego exhibit pointing out which lights were in the wrong place and which gutters were missing. They had to admit though, that apart from a few misplaced wheelie bins it was very accurate. Having chatted over all matters of the Dean Clough Mill as we stood, it was clear that having worked here for a combined period of over 50 years, they were extremely proud of the site and their time-honoured place within it. On the way back to the café, Jeff pointed out a postcard in the gift shop depicting the ‘A’ Mill Loading Bay – their spot – and then very persistently challenged one of the passing curating staff about the whereabouts of what turned out to be a portrait of Jeff. Evidently Jeff was no stranger to portraiture. A previous artist exhibiting in the gallery had taken Jeff as his subject and it was a source of great disappointment to us both that it now resides with the artist and not here at the Mill for all to see. Jeff said that he gets a lot of photographers taking pictures of him, “because you don’t see many people in overalls anymore” he said. He is no longer one of a whole gang of workers maintaining this building but one of three. Just like the Mill itself, Jeff has become an artefact, a memory of a time gone by. But he is incredibly proud to still be a working cog in this redeveloped wheel; this new era for Dean Clough, and the requests of artists to capture and record him flatter and excite him. And so he should be, by putting a subject in a frame and hanging it on the wall, the artist shows the subject admiration, acknowledgement and respect. They are focussing the looker’s attention on this image alone and saying ‘look here, you might not have seen it in this way before, you might have overlooked this.’ Jeff got such a kick from the Lego and his portrait and the photograph of ‘A’ Mill that maybe posed and re-constructed artworks do have their place. Maybe I’ll ask next time, before I shoot. This entry was posted in Winston On the Run and tagged acting, architecture, art, Churchill, David Hockney, Dean Clough, drama, Grantham, history, Isle of Wight, Lego, Mill, My Early Life, period drama, potrait, preservation, street photography, theatre, tour, Travelodge, winston on the run, writing, Yorkshire on October 5, 2013 by johnhcwalton. A bookstore hidden down a curving Edinburgh backstreet, its rough wooden shelves crammed with history, classical passion and beautiful early editions; an antiquarian owner practically covered with his own thin layer of dust. I was holding a worn book with yellowing pages, a navy hardback cover, and a look of having been once loved. Back on tour with Potted Potter, the photo of a young man I had glimpsed in the Cabinet War Rooms was constantly on my mind. Who was he? What was he doing in a cavalry officer’s uniform? And why wasn’t he fat, middle-aged and balding? I needed to find out more. I was not only curious, I sniffed a story. The book in my hands was ‘My Early Life’, Churchill’s description of his youthful days from first memories to nascent parliamentary success. Limping home from my gruelling schedule (two incredibly high-energy shows a day, every day, for a month – don’t let anyone tell you acting is an easy life) I plunged into a hot bath and began reading; immediately I was hooked. As a child I had adored the adventure stories of Dan Dare, Biggles, The Hardy Boys and Willard Price. Here was someone living that life for real, ricocheting around the world in a blur of action, high society and hilarity. One moment he was fleeing from his governess, next he was rioting in a music-hall; finally, he escaped from the South African Boers and became an international celebrity. Audacious tales were strewn with huge personalities: Winston’s father Randolph, a maverick politician who ultimately destroyed his own career; his mother Jennie, a glamorous New York socialite and unparalleled beauty; Mrs Everest, Winston’s nanny and closest friend. 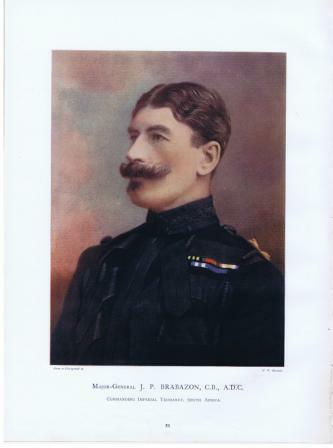 Alongside these principals was a roster of fascinating and often hilarious supporting characters: Prime Ministers, Princes, workers, clergymen, Dickensian teachers and my favourite, Colonel Brabazon: an hilarious, lisping epitome of a gloriously brave but utterly ridiculous Victorian cavalry officer. Reading ‘My Early Life’ was like discovering a different world, one so often suppressed by our country’s collective embarrassment over the colonial era. In the young Winston you could see the tenacity, bravery and leadership that would echo and reverberate into the future; at this point though his destiny was anything but certain. There was tender honesty, the tragically unreciprocated adoration Winston had for his father, the young man’s constant money problems and the impetuousness that would often be his own undoing. Written by Churchill decades later, the entire book also had a fascinating tint: the dying rays of what Churchill himself called a ‘vanished age’. The aristocracy’s grip on power was diminishing, the labour movement growing, and by the book’s end mechanised guns were swiftly bringing an end to the gentlemanly pursuit of war. Yet this was still a time where British officers played party games on the way to battle and fretted about smuggling champagne to the front lines. This entry was posted in Winston On the Run and tagged adaptation, Churchill, Churchill War Rooms, Dan Dare, drama, edinburgh, Hardy Boys, history, hussars, military history, My Early Life, theatre, Willard Price, Winston, winston churchill on September 16, 2013 by johnhcwalton. Actor and Co-Creator Freddie Machin talks about Winston On the Run. This entry was posted in Winston On the Run and tagged acting, behind the scenes, drama, history, period drama, theatre, winston churchill on September 13, 2013 by johnhcwalton.